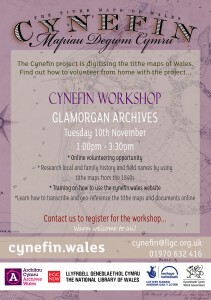 The Cynefin project is digitising the tithe maps of Wales and is looking for volunteers to help with the transcription work online. 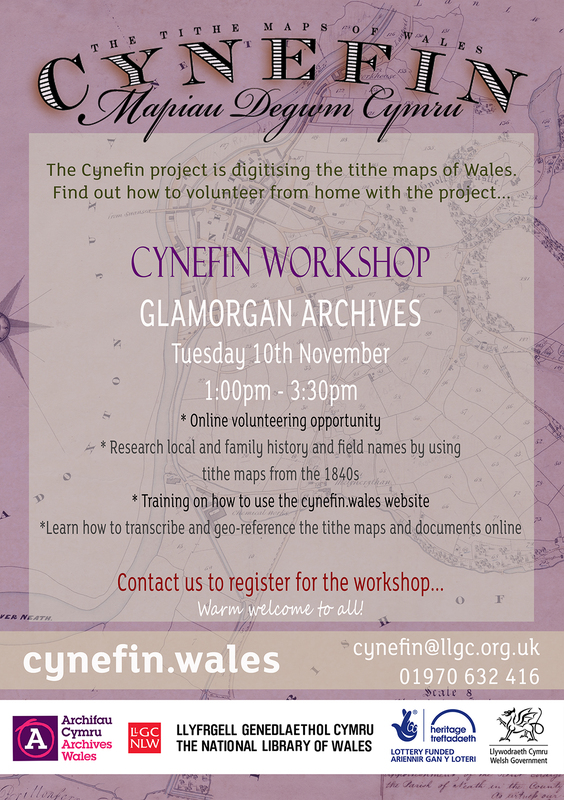 The workshop at Glamorgan Archives will provide an opportunity for potential volunteers to get to grips with the Cynefin website, and to learn about the different tasks which volunteers can contribute to online. There is no commitment in terms of volunteering hours, we would be grateful for any contribution. We would appreciate if those who are interested could contact us to register for the event to avoid disappointment on the day, as there are a limited number of computers available at the archives. Our contact details are on the leaflet. http://www.glamarchives.gov.uk/ Next to the Cardiff City football ground. A nice new building. This entry was posted in Uncategorized and tagged copper works, Cynefin Tithe Maps, Friends of White Rock, White Rock on October 15, 2015 by admin. There are just two weeks to go before the SMART NATURE: Beacons to Bay Conference taking place at the Liberty Stadium on Tuesday 30th June. Over sixty people from a wide range of sectors have already booked but there are still some places available so if you haven’t already registered, please do so soon as places are limited. Attached is the provisional agenda for the event which gives you a flavour of what to expect. The aims of the conference are to inform you about new approaches to managing the natural environment in Wales; to inspire you with positive examples of a more integrated approach; and to involve you by gathering your views and ideas about improving the local environment along the Tawe Corridor and across Swansea Bay. This event is being organised by Swansea Environmental Forum and Natural Resources Wales as part of the Tawe Trial, which is exploring new approaches to managing our natural resources. Bookings can be made online at https://www.surveymonkey.com/s/P3FJR7Z and the event is free of charge. If you are involved in activities related to the environment, planning, regeneration, land management, community development, outdoor recreation, tourism, sustainability, education, health, etc. – this will be of interest to you. Please feel free to forward this email to colleagues that you believe may also be interested in attending. This entry was posted in Uncategorized and tagged copper works, Friends of White Rock, Smart Nature Project, Swansea Environmental Forum, White Rock on June 17, 2015 by admin. A THRIVING River Tawe that links a bustling Swansea city centre with a regenerated Hafod Morfa Copperworks site is envisaged in future. A vision document that’s now been released for the former copperworks site on the riverside includes the potential for a series of pontoons and landing stations along the river that would help accommodate boat trips for residents and visitors from the Maritime Quarter to the area of the Liberty Stadium. Other developments include on-going Morfa Distributor Road works between the stadium and New Cut Road in a bid to boost nearby businesses, relieve traffic congestion in the Hafod area and open up riverside sites for regeneration. Swansea Council and Swansea University are behind the regeneration of the Hafod Morfa Copperworks site. The vision document for the site’s future also includes proposals for a restaurant, an urban square, a living history laboratory and the restoration of historic features. It’s thought the introduction of pontoons and landing stations along the river could help accommodate a local community rowing club as well. The council is also researching potential uses for a plot of land close to the Maritime Quarter’s Sailbridge as it looks to market the site to developers in future. Cllr Rob Stewart, Swansea Council Leader, said: “We’ve already kick-started the regeneration of the city centre and waterfront with the marketing of the St David’s and Civic Centre sites, but we also recognise the importance of the River Tawe. The river has played a key role in Swansea’s development over the centuries but there’s a real opportunity to make it a focal point of Swansea life once again in years to come. We’re committed to preserving and celebrating as much of Swansea’s heritage as possible, which is why consultation we carried out on the city centre’s future earlier this year also included a focus on how we go about making best use of the river. “Our recent 15-year agreement to work alongside experts at Swansea University to further regenerate the Hafod Morfa Copperworks site shows how seriously we’re taking our commitment. Our vision for the site isn’t just about conserving buildings of historic value – it’s also about making the most of the riverside by potentially introducing facilities like pontoons, landing stations, boat trips, housing, water-based activities and a restaurant. We’re looking to accelerate works on the Morfa Distributor Road to help bring about this riverside regeneration, tackle congestion in Hafod and benefit businesses in the area. New railings, trees, seating, bins, and public lighting have already been recently installed on the pedestrian and cycle path between the Tawe river bridges and Swansea Yacht Club. Swansea Marina also again won prestigious blue flag status last month in recognition of its water quality, management and safety. Nearly all original railings at the marina have now been replaced with inwardly curving, stainless steel railings at quayside locations where people change direction or where there’s a high pedestrian footfall. Subject to funding, other new facilities being proposed for the Hafod Morfa Copperworks site include a pedestrian bridge that links to the White Rock site, a new visitor centre, conference facilities and incubation units for start-up businesses. With the support of Welsh Government, Cadw and European funds, progress on site has already included clearing vegetation, stabilising buildings at risk, improving access for visitors, community archaeology fieldwork, new pathways, an audio visual trail and new information panels. This entry was posted in Uncategorized and tagged copper works, Friends of Hafod-Morfa Copperworks, Friends of White Rock, White Rock on June 8, 2015 by admin. AN ICONIC wooden bridge which crosses Swansea’s River Tawe will be restored as part of a major transport improvement scheme in the city. Swansea Council has been awarded £2.7 million from the Welsh Government annual transport grant settlement and will be ploughing the funding into a wide range of projects aimed at improving transport and road safety in the city. Of the settlement £200,000 has been allocated towards restoring the grade II listed Bascule Bridge, located in Morfa area. The unique wooden bridge, which dates back to the early 1900s, is in danger of collapse if not repaired. The bridge is currently out of use. Situated in the shadows of the Liberty Stadium, the bridge is one of the few surviving relics of the area’s rich copper heritage. It had a water-powered lever system enabling a section of the bridge to be lifted to allow sailing ships to pass through. Once restored, the bridge will be brought back into use as a cycleway and footpath, creating an important link on the National Cycle Network 43 and for local match-day connections to the Liberty Stadium. A spokesman for Swansea Community Boat Trust, which runs trips from the marina up the River Tawe, welcomed the news as hitherto its barge was not allowed to pass the bridge due to safety reasons. This entry was posted in Uncategorized and tagged Bascule bridge, copper works, Friends of White Rock, Hafod, White Rock on May 19, 2015 by admin. Cover to Cover are hosting a book launch on Wednesday 27th May at 7pm, at Newton Village Hall, Newton. Download full details from Betsy Poster. The publication is a new edition of the autobiography of Betsy Cadwaldyr – or Elizabeth Davis – the Welsh Florence Nightingale! Betsy was a remarkable woman, with an adventurous life, as a nurse during the Crimean War. The story was first published in 1857, and the new edition with new material has just been published. Tickets are £2 (redeemable on purchase of book) and are available from Cover to Cover, www.cover-to-cover.co.uk. This entry was posted in Uncategorized and tagged copper works, Friends of White Rock, White Rock on May 15, 2015 by admin. A NEW visitor centre, conference facilities and incubation units for start-up digital businesses are among the plans for Swansea’s Hafod Morfa Copperworks site in future. A vision document that’s now been released for the site also includes proposals for a living history laboratory, an urban square, a brewery, a restaurant, a pedestrian bridge that links to the White Rock site, affordable housing and the restoration of historic engine sheds to show how they worked in their prime. Regeneration of the site has already started as part of a project called Cu@Swansea being led by Swansea University and Swansea Council. With the support of Welsh Government, Cadw and European funds, progress has included clearing vegetation, stabilising buildings at risk, improving access for visitors, community archaeology fieldwork, new pathways, an audio visual trail and information panels. A programme of fortnightly site tours is also being organised every other Wednesday from May 6, starting at 2pm. Tours take approximately an hour and a half and will guide visitors around the site, exploring its history, the current project and future plans. Swansea Council and Swansea University are about to sign a 15-year agreement to further preserve and celebrate the site. Professor Huw Bowen, of Swansea University, said: “The new agreement is a commitment from both the university and the council to further regenerate the internationally significant Hafod Morfa Copperworks site. We hope to build on the great work that’s already been done to develop a vibrant and exciting reanimation of a site that was once at the heart of the industrial revolution. Other plans include a workshop providing metalwork craft demonstrations and visitor activities. A pontoon could also provide mooring for Copper Jack – Swansea’s community boat – and other river craft. Contact the Museum Collections Centre on 01792 467282 to book a place on a walking tour. This entry was posted in Uncategorized and tagged copper works, Friends of Hafod-Morfa Copperworks, Friends of White Rock, White Rock on May 6, 2015 by admin.